Love Park in Center City Philadelphia. 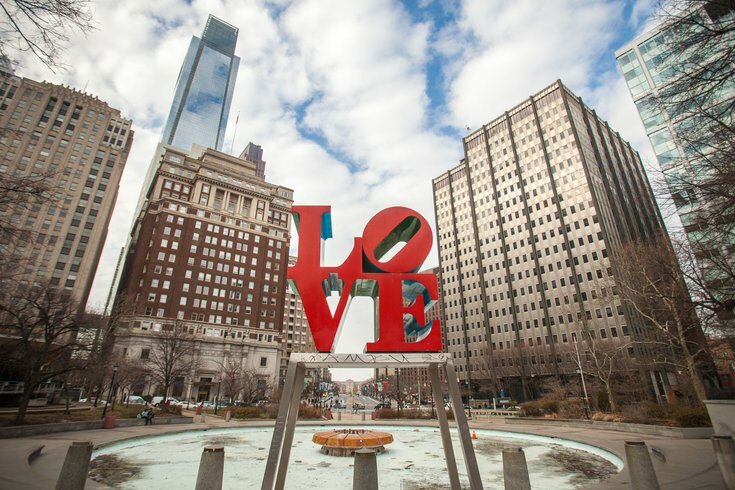 John F. Kennedy Plaza, better known as “LOVE Park,” is slated to undergo a complete overhaul designed to make it more accessible, artistic and interactive. Much is expected to change, but the park’s defining LOVE sculpture – and its pedestal – is going nowhere. The sculpture, first placed there in 1976, will remain in its exact location. The parks and recreation department hosted a public meeting Tuesday night to introduce Hargreaves Associates, the design firm charged with renovating the park, and review public input for the $13.85 million project. Hargreaves Associates presented the firm's vision for the Philadelphia landmark, outlining a list of priorities designed to modernize the plaza while maintaining its inclusive vibe. The landscape architectural firm, based in New York City, has designed numerous urban parks across the world, including London’s 2012 Olympic Park. The agency will oversee several other firms, including Kieran Timberlake, the architectural group that designed Dilworth Park. The design team is expected to incorporate public priorities identified through the city’s civic engagement process, which began back in September. More than 650 citizens submitted written suggestions, many of them calling for water features, more greenery, expanded walkways, enhanced security and open space for public demonstrations. The design work has not yet begun, but Jones and Hargreaves principal Ken Haines highlighted potential strategies for the 2.5-acre park. The design team envisions the park’s eastern border, along 15th Street, to serve as its civic edge, potentially featuring an entrance plaza, fountain or trees. The corner of 16th and Arch streets is expected to remain as a gateway to the Benjamin Franklin Parkway, potentially adorned by flowers and small fountains designed to mitigate traffic noise and create a more intimate vibe within the park. Maintaining the park’s diagonal layout – which aligns with the parkway – is essential, Jones said. “It really gives you a sense of orientation,” Jones said. The LOVE Sculpture will remain near the park’s center, expected to serve as a gathering spot and potentially featuring a lawn, water and fountain. The south border, along JFK Boulevard, could become more porous, creating greater retail possibilities and serving as a location for private or public events. The north edge, along Arch Street, will require buffering because it is located beside the entrance ramp to the parking garage beneath LOVE Park. The might include some type of landscaping or an open, green area. The redesign also will include renovating or replacing the Fairmount Park Welcome Center, an outdated structure built in the 1960s. Much of the park will look different, but Focht guaranteed it would feature the LOVE sculpture, some type of water feature and additional art. The redesign budget includes $250,000 to introduce new art into the park. Anything but another sculpture is being considered. Artists can submit their qualifications until Feb. 14. Conceptual designs for the new LOVE Park should be ready for approval by the Arts Commission in April, Focht said. Final designs are expected by mid-fall. Construction bids will be placed next winter with construction slated to start in the spring of 2016. From that point, the park will be closed for another 9-12 months. About 200 people registered for the public meeting, the final portion of the civic engagement process. Steve Perzan, of Olney, said he wants John F. Kennedy better memorialized in the new park, noting it officially carries his namesake. “John F. Kennedy should be remembered,” Perzan said. “That was the original dedication of the park. He influenced a lot of people in Philadelphia to be the type of people to be civically engaged. Davis Stephon Cherry, of West Philadelphia, said he wants the park to include more seating, but to retain its current atmosphere. He said he is fearful it could turn into a junior version of Rittenhouse Square. Designed by city planner Edmond Bacon, LOVE Park opened in 1965 as a plaza atop an underground parking garage, expanding in 1969 to include a fountain and granite steps. Its famous sculpture was first added in 1976. It was removed after two years, but later purchased by Arts Commission Chairman F. Eugene Dixon and returned to the park. The redesign of LOVE Park follows the $55 million renovation of Dilworth Plaza, which reopened as Dilworth Park in September. The park, located beside City Hall, now includes an interactive fountain, lawn, tree grove and café.